A website dedicated to a beloved Pastor, Friend, Husband and Father. The Way I See It, May 15 will forever take on a different significance for the Hart and Atkinson family. On the day my family celebrates my entry into humankind, the Rev. Ted Atkinson’s family will celebrate the life of their husband and father who departed this life on this date. I didn’t know Pastor Ted as well as I would have liked. Several years ago I introduced myself to him over the phone when I called to do a story on his son Andrew, who at the time was a student at Temple University. Andrew became a friend of former Temple basketball star Lynn Greer. Through Greer’s urging, Andrew volunteered to coach at Greer’s high school alma mater during his senior year at Temple. I called the Atkinson residence to set up a time to interview the Solanco High School alumnus and Pastor Ted answered. He had Andrew call me and I met the Owl senior at the Ledger officer in Quarryville and wrote a story on his experience at Carver High School of Engineering and Science in March of 2001. 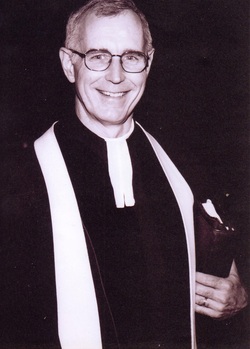 During the months that followed, Pastor Ted often visited our St. Christopher parish for special services when no services were scheduled for Oxford Presbyterian Church. He informed me during one of these occasions that although he was a devoted Presbyter; he thoroughly enjoyed the ritual, liturgy, and tradition of the Anglican (Episcopal) church. I was deeply touched and honored to be asked to speak at one of the 2003 Lenten luncheons Pastor Ted arranged during each season of Lent. I attempted to make a trip to Oxford each Wednesday during Lenten season to hear others from the Oxford and surrounding areas share in their spiritual journey. It was on one of those Wednesday Lenten luncheons this past year that I shook Pastor Ted’s hand for the last time. He looked frail and thin, but possessed those infectious smiles that brightened your day and made you feel loved and respected. For several months during his courageous battle with illness, I prayed for Pastor Ted and his family as part of my daily devotions. He informed me on another occasion that he too rose early in the morning and set aside a time for prayer, reading and reflection. I regret that we didn’t have an opportunity to spend more time together comparing notes on sports, life and humanity, but both of our schedules were hectic and challenging. He will be missed by his family, congregation and community, and by a sports writer who admired and regarded him highly. I wasn’t able to attend his funeral Sunday, May 23, but I was informed that over 900 individuals celebrated his life and memory. What a fitting tribute to a man who walked the talk. May his wife Kay, sons Andrew, Philip and Mark, find comfort, assurance and peace, and may that smile on Pastor Ted’s face bring a feeling of love and respect to those he is meeting in his eternal resting place. Surely God has said to Pastor Ted, “well done, good and faithful servant.” He was one of Oxford and Solanco’s finest.